Well we’ve done it again; landed back at the Holidays! It might be time to get our minds off the news of the day and try to really get into the season. And, as we’re come to discover, perfect gifts don’t find themselves. But we can definitely help YOU find them! Some of the ways we’re doing this is to stock our store up with amazing goods by scads of local artists and crafters…. and then going the extra miles to host parties and trunk shows where they bring even MORE of their amazing creations for you to purchase! 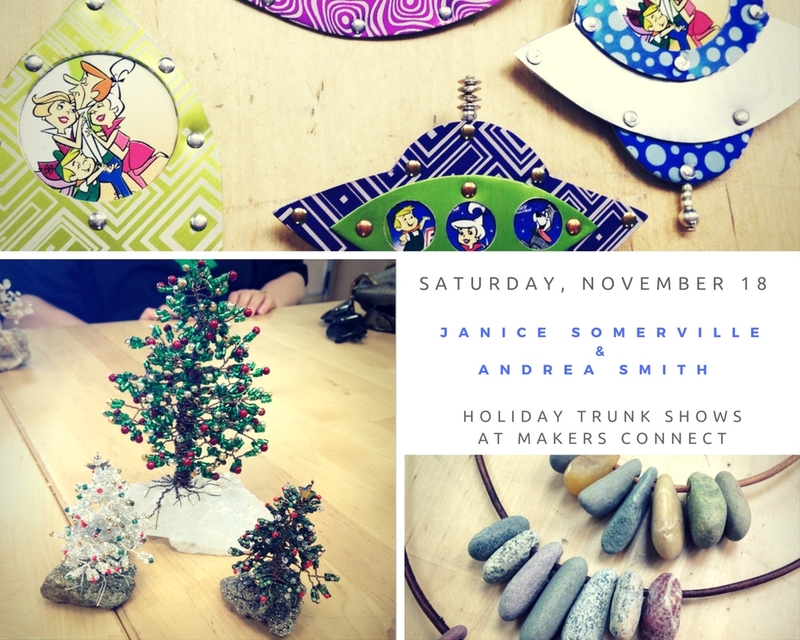 The first show will be on Saturday, November 18 with Janice Somerville and Andrea Smith. 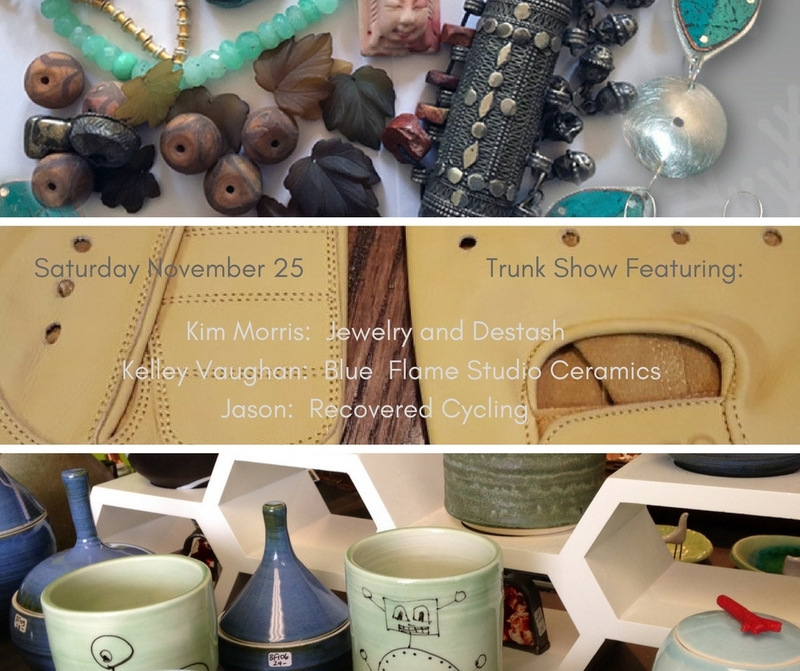 Then the following week, we have yet *another* amazing show with three artists; Kim Morris, Kelley Vaughan and Jason from Recovered Cycling! Janice makes adorable robot critters using cast-off metal parts, aluminum space-inspired jewelry, drilled rock necklaces, and brightly painted masks and crazy heads out of colorful ceramics. Andrea makes amazing tiny beaded trees set onto geodes, as well as beaded jewelry using her great color sense. She will probably be demonstrating her technique during the show! Kim will be de-stashing many year’s worth of jewelry findings, beads, and gemstones, plus her own incredible jewelry. Kelley is bringing her amazing Mid Century Modern styled pottery; from tiny vases with crystal-enhanced lids to her signature round white airplant holders. Jason is a cyclist with passion for quality leather goods and customization of your ride. Please come out, enjoy some drinks and bites with us, and delight your family and friends this year with handmade goodies from your friends and neighbors right here in super cool East Dallas! This entry was posted in Uncategorized and tagged andrea smith, beaded trees, clay heads, east dallas artist, east dallas makers, Janice Summerville, jewelry trunk show, lake highlands, Makers Connect, makers connect dallas, masks, old lake highlands, small business Saturday, trunk shows, upcycled art by Truly Unruhly Studio Jewelry. Bookmark the permalink.